If you are looking for a natural boost to your weight loss efforts, apple cider vinegar and lemon juice may provide some small benefits. Because it helps lower blood sugar, increases satiety and may improve digestion, apple cider vinegar may help you shed pounds and improve your health. Simply consuming lemon juice doesn't melt away fat as some claim, but it provides some nutritional benefits. Consult your physician before adding supplements to your diet or beginning a weight loss regimen. Apple cider vinegar is believed to lead to weight loss by boosting metabolism and suppressing the appetite. According to a 2005 study published in the European Journal of Clinical Nutrition, vinegar increases satiety, in addition to improving insulin sensitivity. The study found that the higher the dose of acetic acid -- the main active compound in apple cider vinegar -- the greater the reported feelings of fullness after a high carbohydrate meal. Increased satiety should lead to a lower calorie intake and weight loss over time. Claims that apple cider vinegar improves metabolism have not yet been substantiated by science. Many claims have been made regarding lemon juice's role in weight loss and health, but few of them are supported by research. Lemon juice may not dissolve fat or detoxify your body, but it is a good source of potassium, vitamin C and citric acid, all of which possess health benefits. A 2005 study published in the Journal of the American College of Nutrition found that individuals with adequate vitamin C status oxidized significantly more fat during exercise than those with a depleted vitamin C status. An ounce of lemon juice has only seven calories, but provides 20 percent of the daily value for vitamin C, so adding lemon juice to water throughout the day can help you meet your needs. Other good sources of vitamin C are kiwi fruit, red bell peppers and other citrus fruits such as oranges and grapefruit. Apple cider vinegar and lemon juice are two natural substances you can add to your diet that may support your weight loss efforts. Neither can replace a healthy diet and exercise to lose weight, however. If you are someone who doesn't love to drink water, adding fresh lemon juice may help you to drink more water, which may help you feel full throughout the day and boost your energy level. A small amount of apple cider vinegar can be diluted in water and consumed as a beverage, but a tastier way to ingest either of these zesty liquids is to use in cooking. Blend them into marinades or salad dressings or squeeze lemon juice onto cooked fish. Beware that daily consumption of acidic foods or drinks, such as lemon juice and vinegar, may lead to the erosion of the enamel on your teeth. 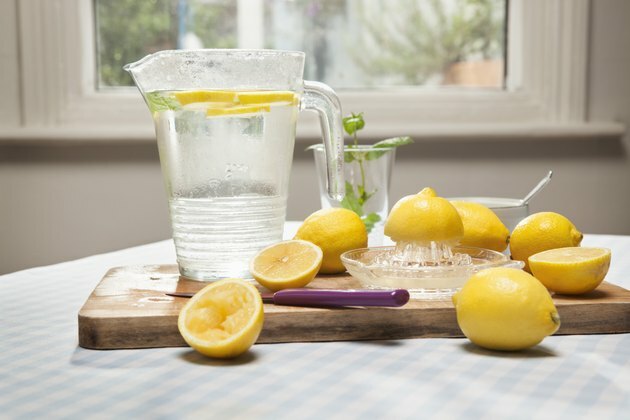 NY Mag: The Cut: Can Lemon Water Really Help You Lose Weight? Does Pickle Juice Increase Metabolism?